The BMW Vision iNext was revealed in the belly of a Lufthansa 777 cargo plane. The BMW Vision iNext concept is a winning bingo card of auto industry buzzwords. It is also our best look yet at the future of the German luxury brand. A production version will appear in showrooms in 2021 as an all-electric, level-3 semi-autonomous SUV from BMW’s i brand. In the belly of a Lufthansa 777 cargo plane on the tarmac at John F. Kennedy airport in New York, Froehlich stepped aside, and the iNext concept was revealed on a turntable inside the plane. The car is making a globe-trotting debut, landing in four cities in five days, as the 777 flies from Munich, to New York, to San Francisco and finally to Beijing. Consider the Vision iNext concept as a kind of North Star for BMW; something they may never actually get to, but something they are working towards. It comes amidst a barrage of all-electric SUV announcements. Mercedes unveiled the EQC, Audi unveiled its E-tron — both of which are slated for production in 2019 — and Ford showed a sketch of an as-yet unnamed all-electric ‘ute scheduled to arrive in 2020. BMW board member Klaus Froelich expects the company will have sold more than half a million electric vehicles by the end of the decade. Exactly what kind of experience drivers can except from BMW’s SUV-esque iNext when it lands in showrooms in 2021 remains unclear. BMW’s fifth-generation electric drivetrain will provide a range of more than 600 kilometres (on the somewhat optimistic WLTP test-cycle) and go from 0-60 mph in less than four seconds, Froehlich said. Electro-mobility is the “new normal,” he added. BMW has been working on modern electric drivetrains since 2004. “Everybody said it’s nonsense, it’s too expensive, it’s not mature — but we have [now] developed five generations.” Other upcoming all-electric models from the company include the 2019 Mini Electric and 2020 BMW X3. If regulations allow, the iNext will be BMW's first level-3 autonomous vehicle. The iNext will be – if regulations allow – the first BMW with a level-3 conditionally autonomous system, meaning the car could assume driving responsibilities in certain circumstances, with the expectation that a human driver would be able to take over on short notice. BMW's top designer says the bucktooth grille is just 'a first idea,' and not necessarily the face of the brand's next generation. In person, the iNext appears somewhere between an X3 and X5 in overall size. The batteries are slung low, under the floor. There’s a huge amount of glass, especially on the sides, where a low beltline makes for a beautifully airy interior. It’s a cab-forward shape, but not as extreme as Jaguar’s I-Pace. The iNext's futuristic interior, sporting several experimental user interfaces, is the element of the concept least likely to make it to production. 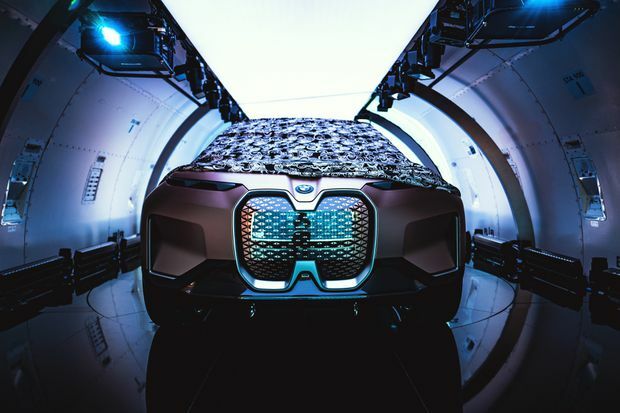 Unlike the existing i3 and i8, the iNext will not use carbon-fibre-reinforced plastic for the entire passenger compartment, instead using more traditional automotive manufacturing methods. As for the interior, it is the most ambitious and futuristic aspect of the car, and therefore also the least likely to make it into production. BMW continues to experiment with new types of user interfaces. To the holographic displays, gesture controls, and touchscreens the brand is already working on, the iNext adds an overhead projector that displays a virtual interface, a light-up jacquard fabric on the seats – which you can trace your finger over to summon a radio station – and natural voice recognition powered by some kind of artificial intelligence. Both Klaus Froehlich and Adrian van Hooydonk were confident that what they’ve shown here inside the 777 plane will be quite similar to what you’ll be able to buy in showrooms in 2021. But many crucial details regarding just how autonomous and intelligent it will be – or is allowed to be – are still missing. It is those details that will make all the difference in a market suddenly inundated with supposedly game-changing, disruptive and buzz-worthy vehicles.